Lab Supply proudly carries a number of fantastic feeds from LabDiet. LabDiet 5025 is formulated specifically to help guinea pigs maintain reproduction, lactation, growth, maintenance. 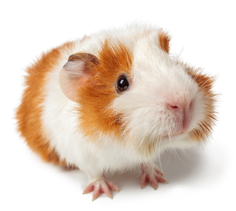 This diet is great for guinea pigs of all ages and lifestyles. It is made from the highest quality ingredients available to assure minimal biological variation in long-term studies. This is a complete guinea pig diet and no supplemental ingredients are needed. LabDiet 5025 has all of the proper levels of Vitamin C already included as well. If you would like to view a complete nutritional guide and other information on this diet, then please click here to view the product PDF. Here at Lab Supply, we are committed to making sure you find exactly what you are looking for. If you have any questions about LabDiet 5025, then please click here to visit our contact page. We will be more than happy to answer any questions you may have.